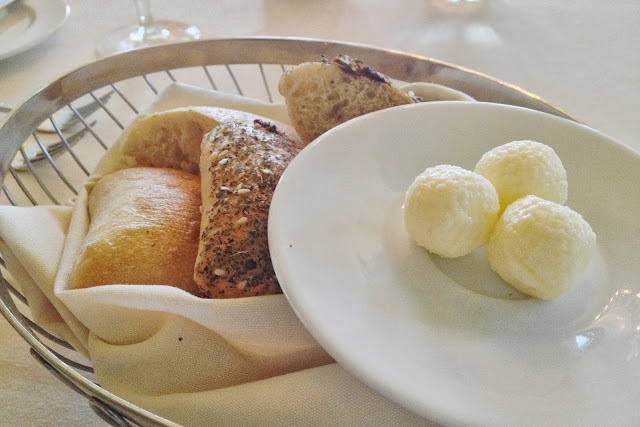 In conjunction with the October MSPMag Minneapolis and Saint Paul Restaurant Week, I would like to share my dining experience at Forepaugh's during the July Restaurant Week. 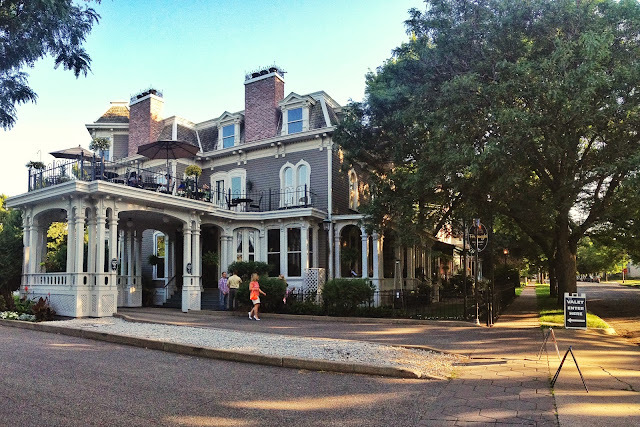 Forepaugh's is an old mansion converted into a restaurant located in the historic downtown Saint Paul. Prior to my visit, my friend and I drove pass the restaurant during an evening and we were amazed by the beauty of the building. It made me positive to dine at Forepaugh's, as to try out chef Donald Gonzales' dishes after winning the Minnesota Monthly Magazine chef challenge in Mall of America on May. Upon entering the restaurant, the two of us were asked to wait at a narrow alleyway, and then escorted up to the top level at the three-storey mansion. The house was pretty big, with larger crowds seated at the lower levels. I like the ambient of the restaurant a lot, especially the white tablecloth - it's hard to find places with nice white table settings anymore. First, we were served the house bread, which is sundried tomato bread. It was extremely delicious perhaps the most delicious bread in my whole life. There were several options of appetizer, entree (main course), and desserts to choose from the Restaurant Week menu. For appetizer, we had Chinese Scallion Flatbread and Malaysian Chicken Samosas, which unfortunately did not impress the two of us a lot. I prefer the flatbread better than the samosas, but beware of the heat! The appetizers were slightly huge on portion, so we had to box half of the portion to save some space for entree and dessert. 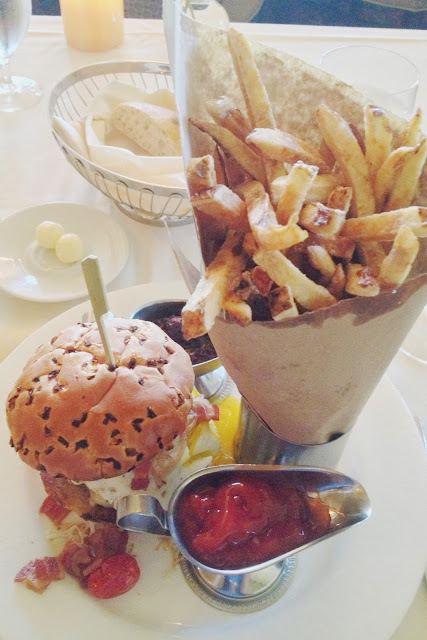 We ordered the Pan-Seared Walleye and Ultimate Opus Burger as entree. The walleye was clearly the star of the night. 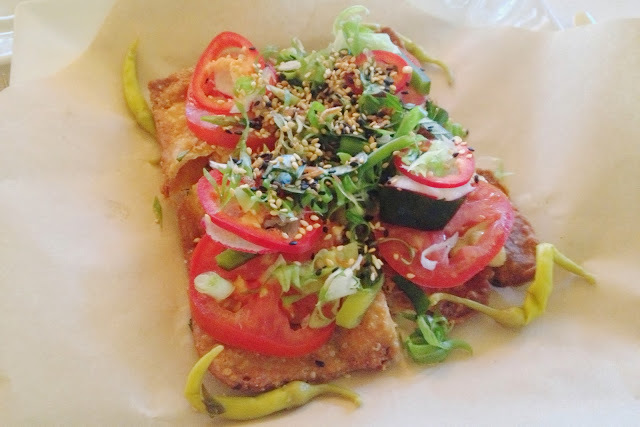 The fish was fresh and perfectly cooked with a crisp outer layer. The curry broth was not too overwhelming, and combined with the fresh vegetables were very refreshing. Definitely a must order. The burger, on the other hand, was not as pleasing. The patty was really dry. 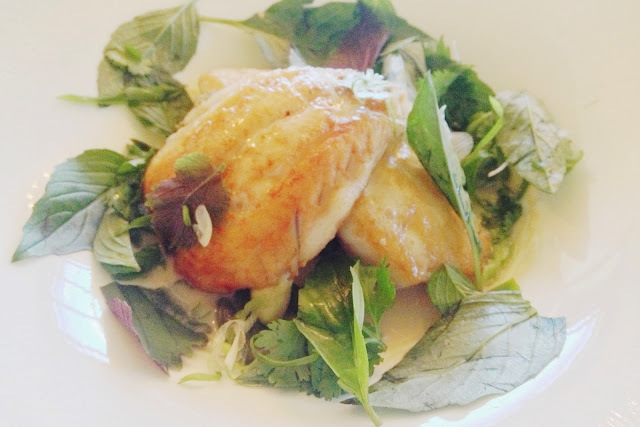 If you are a fan of truffle, this dish had a very strong truffle aroma. 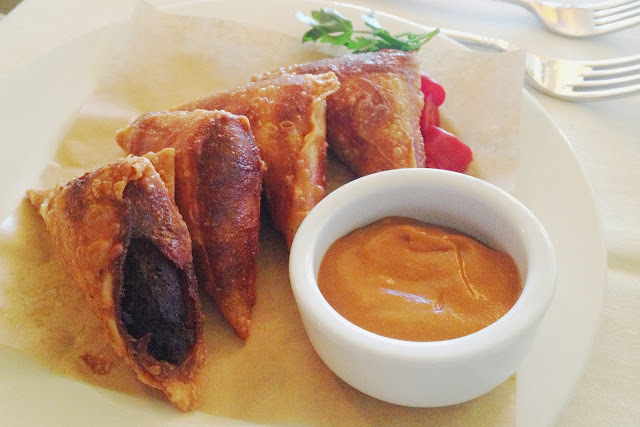 But nevertheless, the short rib dipping sauce deserves a try. Lastly, the desserts were fantastic. We had Deconstructed Banana Cream Pie and Peanut Butter Crunch Bar. Do not underestimate the look of the banana cream pie. 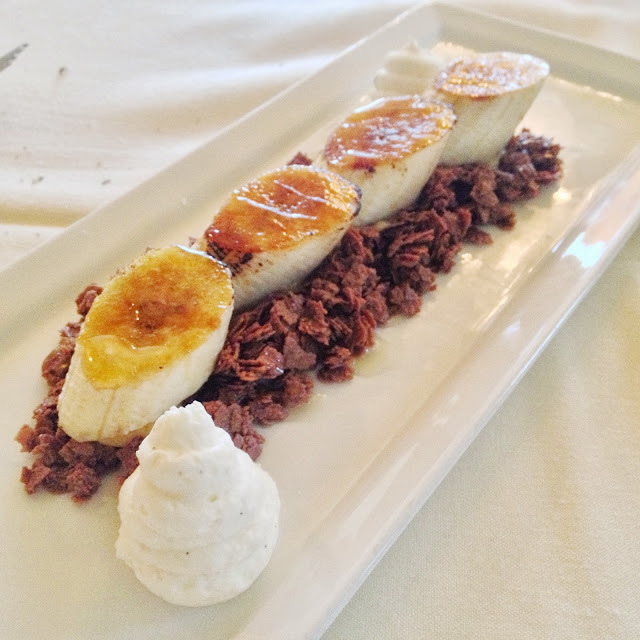 Although it merely looked like a pile of chocolate coated oats topped with bananas, the dish is many times better than you thought, if not tastier than traditional non-deconstructed banana cream pies. From the appetizer and entree, I can conclude that chef Gonzales has definitely been much inspired by Asian elements - from the usage of cilantro, herbs, chilies, and combination of vegetables and ingredients. The dining environment was nice, albeit some tables being too small / cramp for two. 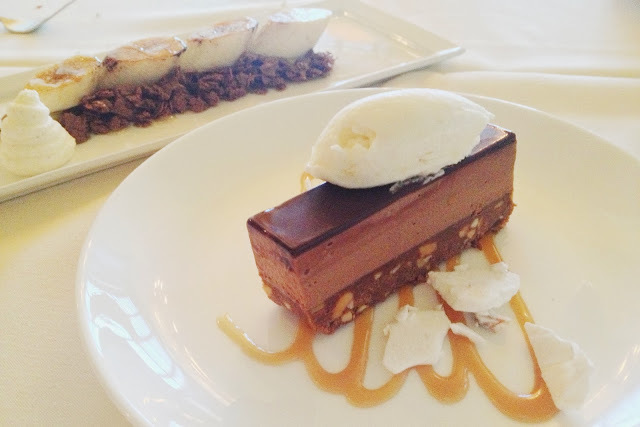 I definitely fell in love with Forepaugh's, especially the fish and dessert. But I'll pass the appetizer and burger.